It was days later, and head coach Andy Coen was still frustrated with last week’s loss. That was the takeaway from the two pieces that came out in the local media this week, one from Lehigh Sports Central, and the other from Keith Groller of The Morning Call. In last week’s post game press conference, and this week’s media meeting, the theme was “cleaning up the mistakes”. In the post game press conference, junior QB Brad Mayes was asked about how he felt about his performance in the 38-35 loss – a game where he had a stellar statistical game, with over 400 yards passing, 4 touchdowns and 0 interceptions, but the Mountain Hawks as a team came up short. The Tampa, Florida native definitely had a fresher memory of what he considered mistakes. Season openers like this, where your team loses, are rarely deal-breakers when it comes to a football season. Assuming Villanova continues to surge forward and have a good year, it’s likely that Mountain Hawks fans will look back at this game as a close, hard-fought loss against a tremendous team. But critical in that assumption is how the team reacts after a loss like this – how a team rebounds the following week, and how they work. In that sense, it should be an interesting week in the run-up to the road game at Monmouth next weekend. Head coach Andy Coen would hear nothing of moral victories in the post game press conference. “I thought we had every opportunity to win this football game,” Lehigh’s frustrated head coach said. It was a game where neither side looked like they were in mid-season form, though you could see the quality shine through offensively on both sides at different times. So the outcome hinged on mistakes, and who made fewer of them – and that team was Villanova. That shouldn’t take away from the offensive fireworks on both sides. There was the tremendous blocking up front that set up a great rushing day for Villanova RB Matt Gudzak, who ran for 145 yards and 2 touchdowns, and an effecient all-purpose yardage of a day for Wildcat QB Zach Bednarczyk, who went 17 for 23 passing and scored three touchdowns, two through the air and on the ground. And there was the electricity of junior QB Brad Mayes repeatedly connecting with senior WR Troy Pelletier, senior WR Gatlin Casey, and the newest starter in the receiving corps, junior WR Luke Christiano. Mayes went 33 for 49 passing for 406 yards and 4 touchdowns, and some of them were a sight to behold. Yet it would boil down to mistakes – a pass here with too much mustard, a dropped reception there, a missed assignment there – and Lehigh simply made too many of them to beat a quality Top 10 ranked team at home. Before we close the book on spring ball, I wanted to pass on my thoughts and observations about the spring session and the prospects for the 2016 season. 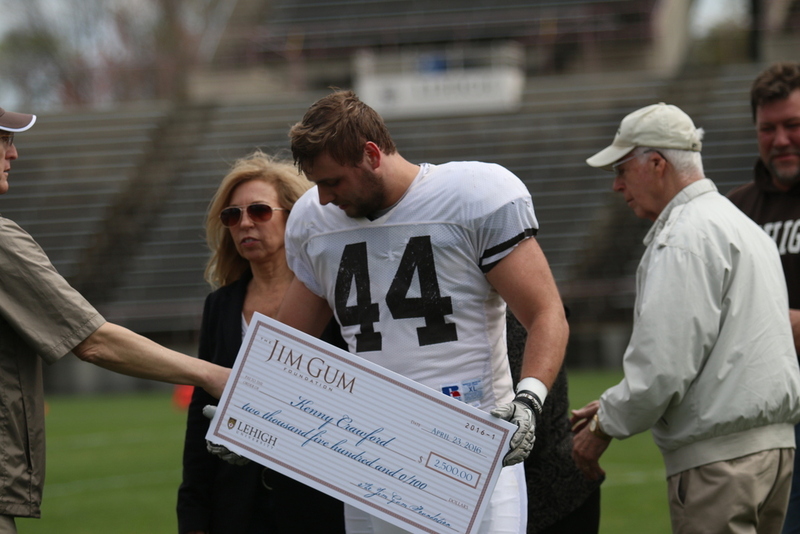 But before I do, I also need to share one of the great traditions of the Lehigh spring game – the announcement of the recipient of the Jim Gum scholarship. Presented by the non-profit Jim Gum Foiundation, the scholarship award is presented in the name of Jim Gum, a three-year starter for Lehigh in the 1980s and Penn Argyl standout. He died due to complications from ALS in 2006. Senior RB Kenny Crawford was the recipient of this year’s award in what is always a heartwarming yet humbling ceremony on the field.